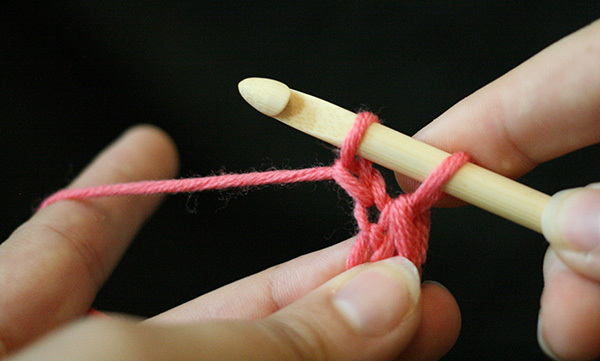 A lot of bi-craftual makers -- people who both knit and crochet -- find that they have very different tensions between the two crafts. 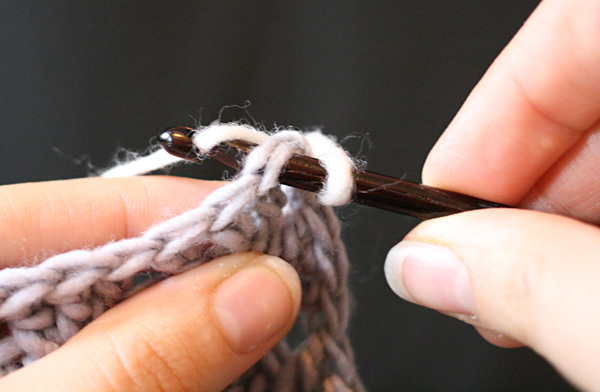 These differences can be especially pronounced if you knit with the yarn in your right hand (aka English or Throwing Method) and Crochet with the yarn in your left. Trying to find a stitch gauge that pairs your knitting and crochet takes experimenting and a willingness to play a little before jumping into a pattern. Swink! is a little different because you begin with a crochet gauge swatch that you measure yourself --you don't need to match a pattern gauge; you just keep track of a gauge you are comfortable with. Swatch, measure; then wash, block, and measure again. Fill in the worksheet (which provides a custom fit!). 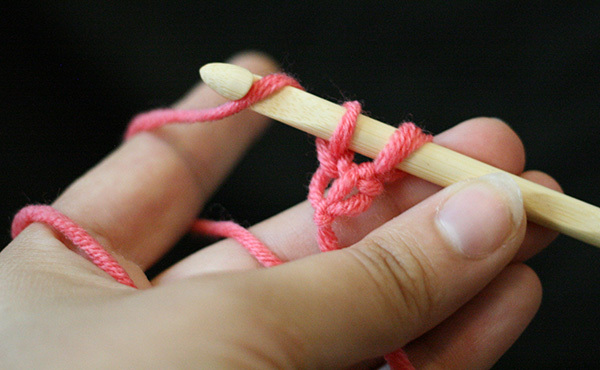 When you start to knit, you'll pick up knitting stitches along the edge. 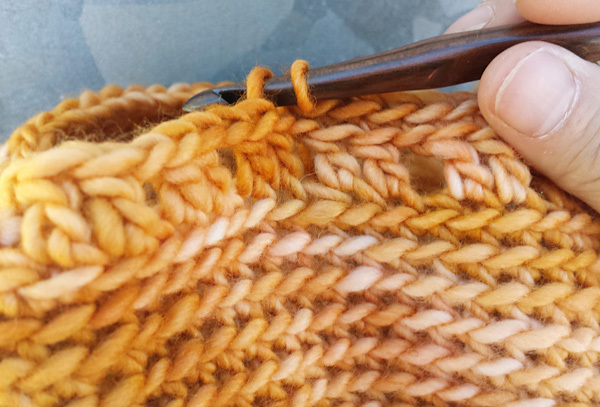 If your knitted edge doesn't ruffle or pull too tight, you're good to go. 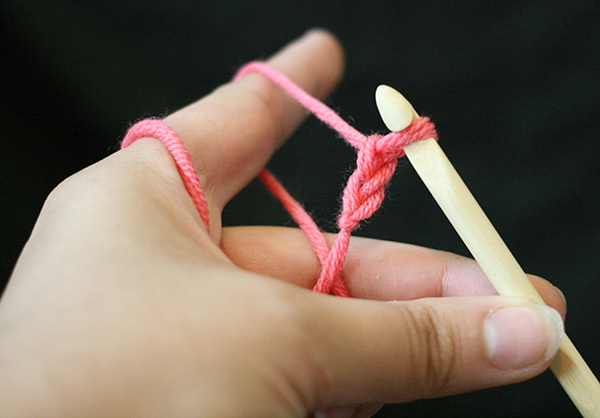 If not, then you can change your knitting needle size accordingly. You may recall the Foundation Double Crochet we used for Crane Hill. Swink! begins in the same way, but with a single crochet instead of a double crochet. Let's walk through it. yo, pull through both loops. yo, pull through both loops. 1 more Fsc made. Repeat from * until you've made required number of foundation stitches. You'll notice the soft horizontal lines in Swink! These are made by crocheting through the back loop only. Across the top of a crocheted row is a neat little chain. If you anchor the next row by pushing your hook through BOTH halves of each chain, the finished fabric is firm and continuous. But with Swink! we want a softer, fabric with more drape. A fabric more suited to this little wisp of a sweater. So, when you anchor the next row, stick your hook through the back loop only. Swink! was inspired by the Japanese fashion of layering loose pieces of varying lengths. 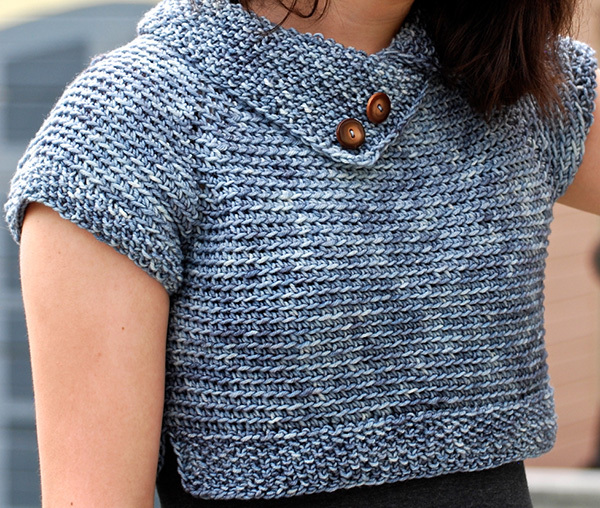 I wanted to make a slightly unstructured sweater that was maybe even more of an accessory than a garment. You can throw it on over lots of things for a little warmth and it will spice up or change the look of an outfit. The name came about when I showed the sweater to my sweetie, and he said something like, “It's just a wink of a sweater... it's a Swink!" Swink! 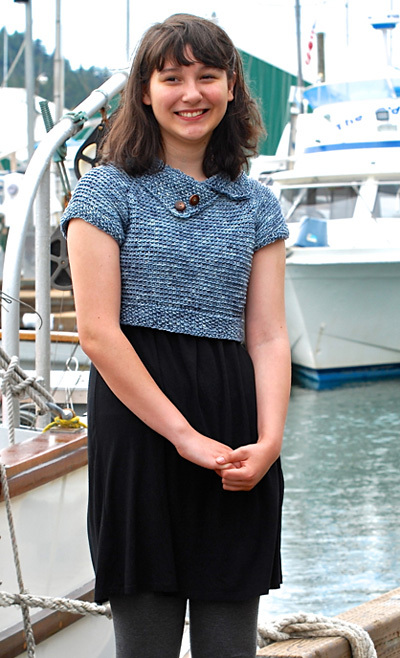 is crocheted from the neck down using the neckline measurement as a starting point. The sleeve caps and length are crocheted to fit. Try it on as you go, or size it to match a sweater or top that looks great on you. This pattern is in worksheet format—that means there's no guessing about what size to make or how your Swink! will fit. Making Swink! just requires the same things you need for any garment—a swatch, and your measurements. After that, we walk you step-by-step through a few easy calculations that make this pattern zoom along and fit great. There are a few things you don't have to worry about with Swink! : you'll never count rows, and you don't have to keep track of which size or measurements to follow because this pattern was written JUST FOR YOU. Swink! is crocheted to fit. (Shown in size S/36 inches). Follow the worksheet to crochet and knit to the desired measurements. Since Swink! is crocheted to fit, begin by getting measurements of the body you're crocheting for. 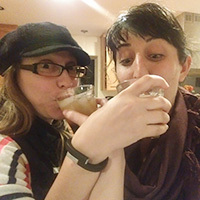 If you're making this for yourself, it helps to have a friend measure you. Note: we give some calculations a letter name if we're going to refer to them again later in the pattern. A Tree Hugger's Wife Yarns Best of the Worsted [100% Superwash Merino; skein 175 yd/160m per 100g skein]; color: Stormy; 3 (3, 4, 4, 4, 5, 5) to fit bust sizes 28[30, 32, 36, 40, 44, 48, 50] inches. Note: yarn requirements are estimates; actual usage will depend on your gauge and size of finished piece. It's a good idea to have an extra skein on hand. ch 30, and join to work in the round. Sc-blo around until your piece measures at least 6 inches. Knitted stitch gauge for the collar and bottom edge should match the crochet stitch gauge. Pick up stitches along the last edge of the crocheted swatch with needles the same size as your hook and work back and forth (in rows) in seed stitch. If your work lays flat without pulling or ruffling, you've found a good match. 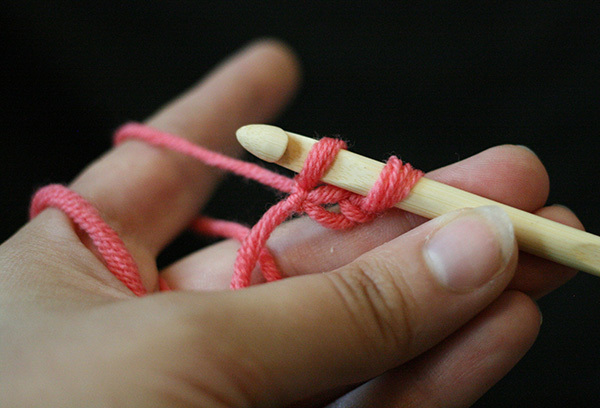 If your knitting is tighter than your crochet, go up a needle size. 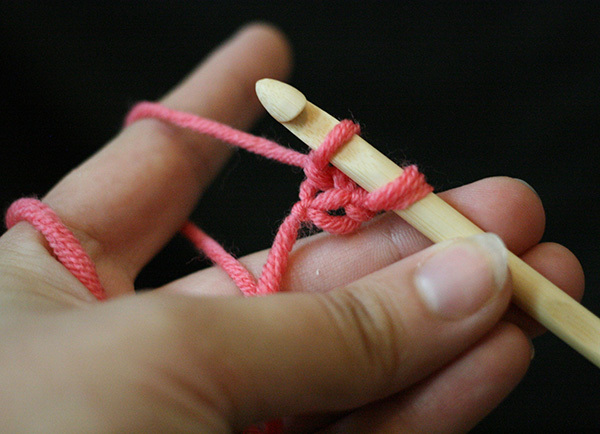 If it's much looser, try a smaller needle. These calculations account for the change your garment will undergo when blocked, and work in the right amount of ease to give you Swink! its cute boxy shape. A note about gauge: This pattern plays with gauge by pairing a large hook/generous gauge with a springy-twisty heavy worsted yarn. The result is a fabric that has both drape and a lot of stretch. If you choose a different kind of yarn, you don't have to match the pattern gauge, but you do need to accurately measure your gauge to make the calculations work. 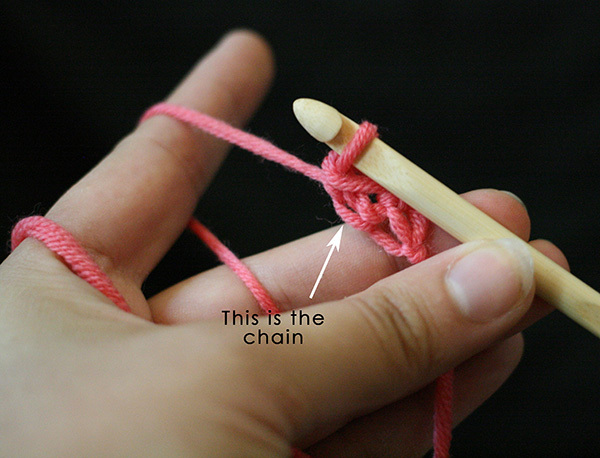 fsc (foundation single crochet): chain 2, insert the hook into the 1st st, pull up a loop, ch 1, yo, pull through both loops. *[Insert hook into the ch 1 just made, pull up a loop, ch 1, yo, pull through both loops. Fsc made.] Repeat from * until you've made required number of foundation stitches. 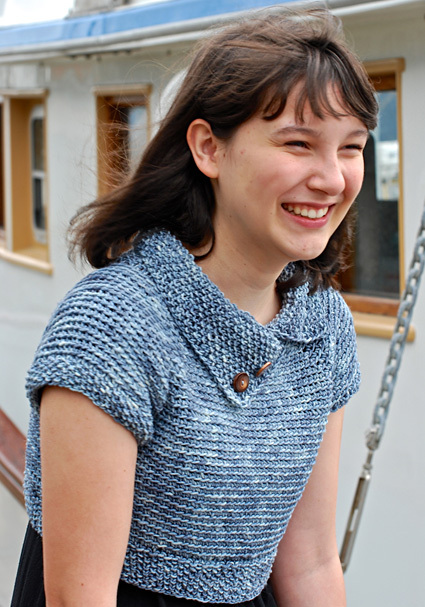 The collar and edging are knitted in seed stitch with a slipstitch edge. Row 1 [RS]: Sl 1, [k1, p1] to last st, k1. Row 2 [WS]: Sl 1, [p1, k1] last st, k1. All rows: Sl 1, [k1, p1] to last st, k1. The cuffs are knitted in seed stitch in the round. Round 1: K1, p1 around. Round 2: P1, k1 around. Round 1: *K1, p1, repeat from *, k1. Round 2: *P1, k1, repeat from *, p1. For example: If my cross-back measurement were 14, I would have a neckline measurement of 20.16 inches. Multiplied by my crochet gauge = 63 sts. 60 is the closest number divisible by six, so my foundation chain would 60 +4 = 64 sts. Using the (fsc) calculations you just completed above, Fsc __________ sts. Join the foundation row to work in the round. Mark the join with coil-less safety pin on the bottom-side of the foundation. This will be the center front of your sweater. From safety pin, count [(S) -1] _____ sts, place Color A marker in next st, count (S)______ sts, place color B marker in next st, count (FB) ______ sts, place color B marker in next st, count (S)_______ sts, place color A marker in next st. The smaller sections will become your sleeves. The larger sections will become your front and back. Increase Round: [Sc-blo to 1 before marker, 2sc in next st, sc, move marker up, 2 sc in next st] 4 times, sc-blo to end of round. Repeat increase round until front section measures to your calculation (I) from the worksheet above, and the sleeve section wraps comfortably around your arm when you try on the sweater. Next round, form sleeve caps: *[Sc-blo to 1 before marker. Remove marker, insert hook into both loops of marked st, pull up a loop, ch 1, yo, pull through both loops. Make 2 fsc. Insert hook into ch from last fsc, pull up a loop, insert hook into next marked st (remove marker), yo, pull through all loops on hook.] Work even in sc-blo to next marker, repeat from * to form second armhole. Sc-blo to end of round. Mark the 2 center sts under each arm with split ring marker. Sc-blo even around until sweater reaches the Swink! length you measured above, or falls to a length you like (remember you'll be adding a 2-inch edging). With WS facing, starting at the position of at coil-less safety pin, join yarn on the flip side of the foundation round (you'll see what looks like a round of stitches), and using circular knitting needle, pick up the back loop only around the neckline; when you've picked up all the way around, continue picking up the front loop of the next 3 inches. Do not join. Work back and forth in seed stitch until the cowl portion measures 5 inches. Bind off in pattern. The bottom edging is worked in rows in two parts, front and back. Divide by 2, and mark division at each underarm with coil-less safety pin. 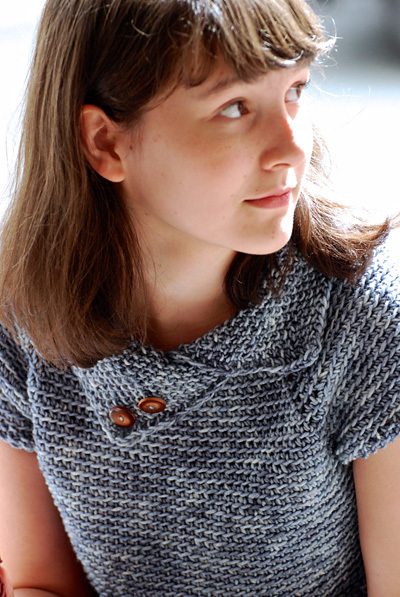 With wrong side of front facing, join yarn in front of right-hand coil-less safety pin. Using circular needle, pick up the back loop only across to next safety pin. Work back and forth in seed stitch until edging measures 2 inches. Bind off in pattern. With RS facing, starting at the underarm rejoin yarn, and using needles for small circumference, and pick up the back loop only of sts around the sleeve in work in seed stitch in the round until cuff measures 1 inch. 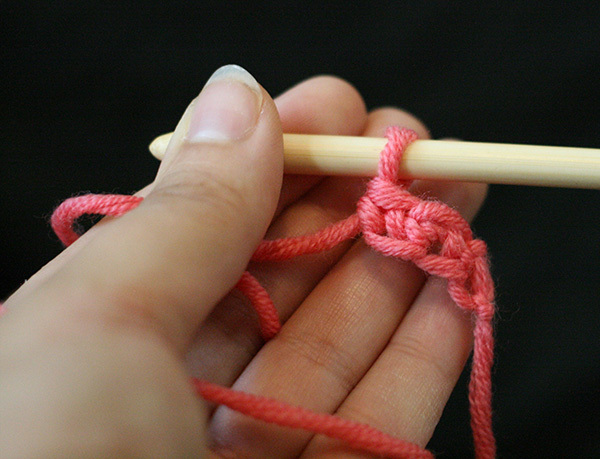 Bind off in pattern. Repeat for second cuff. Weave in ends. Wash and lay flat to dry. Sew buttons on to outer corner of cowl, half an inch or so from bottom and side edge (see photo).